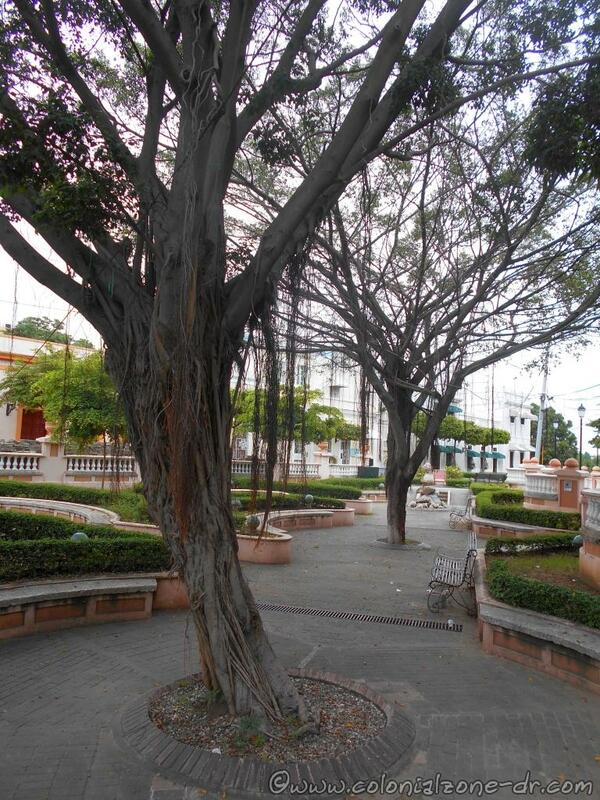 Located in a quiet part of Ciudad Colonial is the nice little Plaza Parque Pellerano Castro. 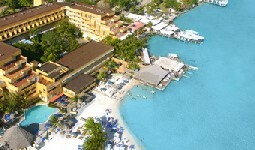 It is also known by the locals as Parque Rosado / Pink Park and Parquecito De Los Poetas / Poets Park. Whatever you call it, this out of the way park is a nice place to rest relax. 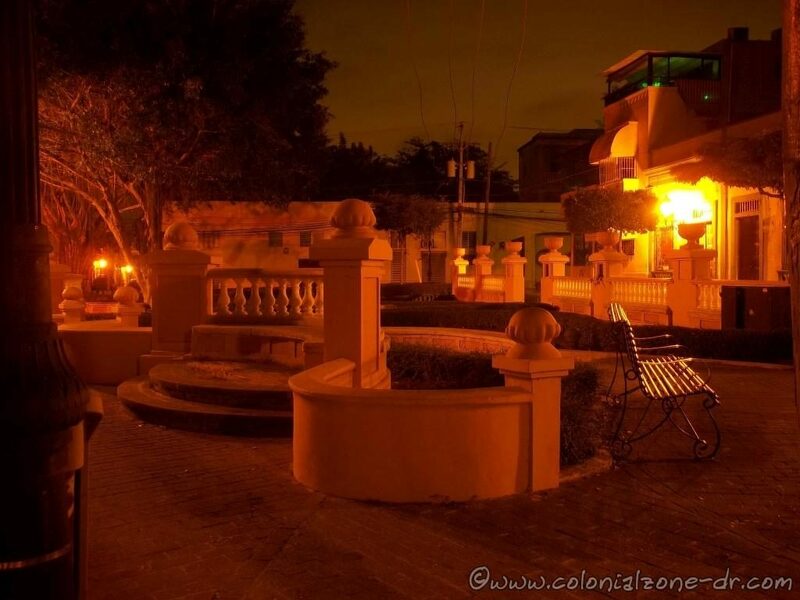 The park had a make-over in the 1990s and was remodeled by the architect Manuel S. Gautier. 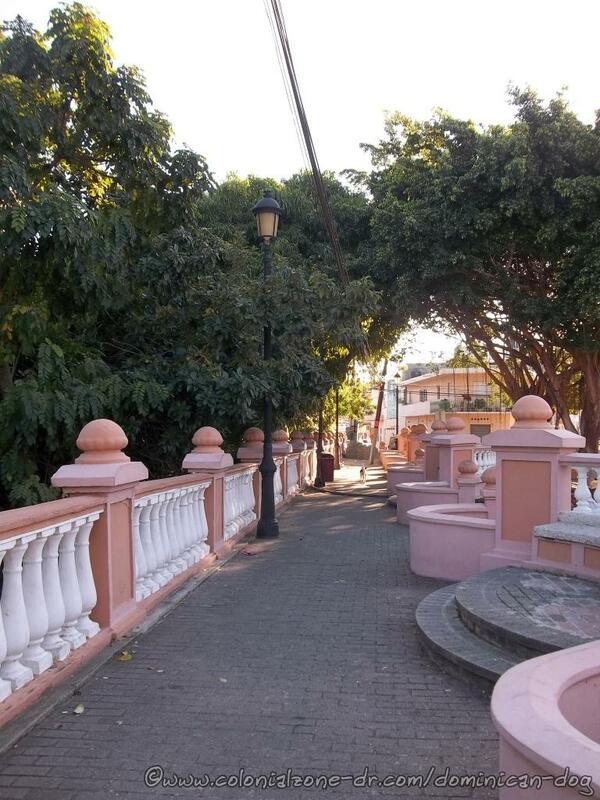 Parque Rosdao /Pink Park, named such because it is painted a soft pink color, is a perfect place to rest in peace and quiet. There are many benches located under beautiful shade trees with hanging creepers giving this park a unique feeling. The other edges of the park have banana, avocado and mango trees. 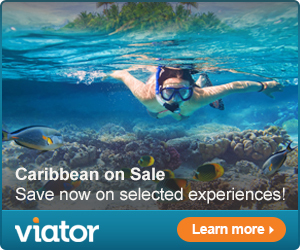 You can also see some chickens running around from time to time. If you’re lucky you may get to meet some of the local dogs who make this park their home. 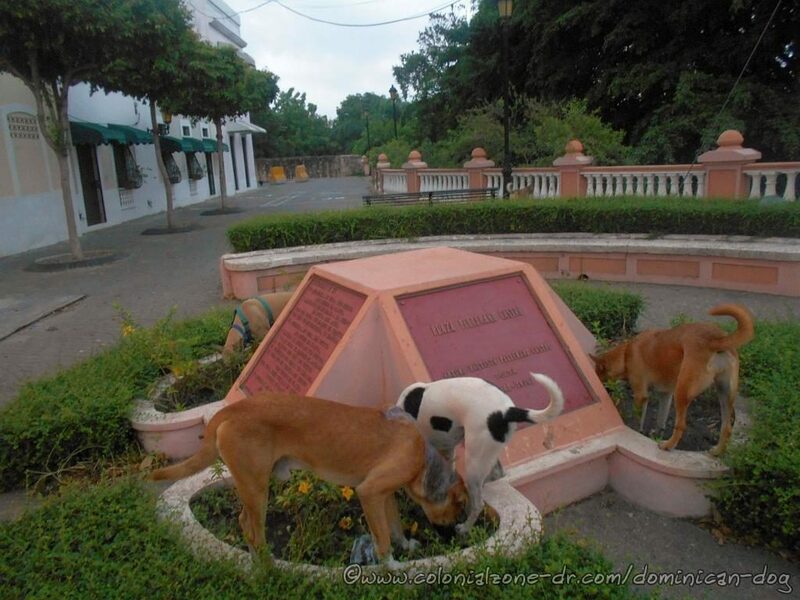 The local dogs visiting the place where the bust of Pellerano Castro once stood in the park that is his namesake. 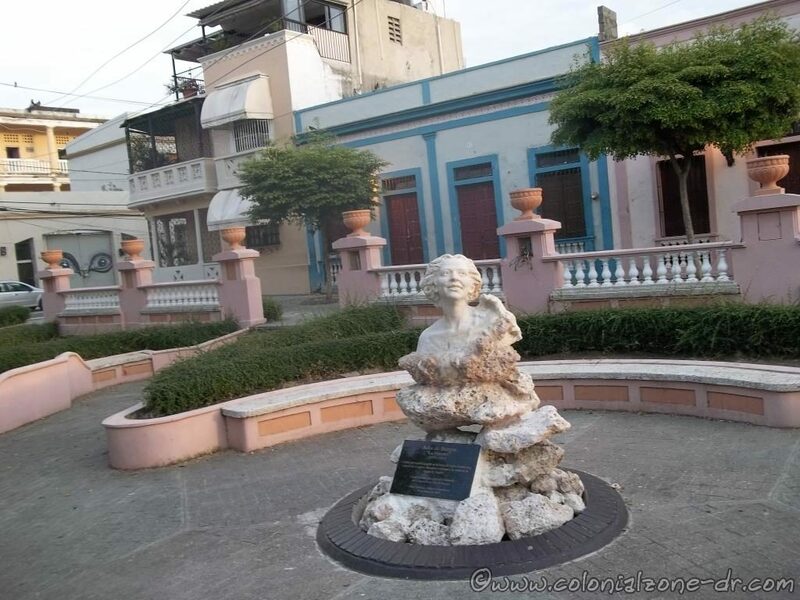 This quiet park is named after the poet Arturo Bautista Pellerano Castro, who was also known by the pseudonym of Byron, born in Curazao March 13, 1865 and died in Santo Domingo May 5, 1916. There once was a bust of the poet located in the park. There is a stand where the poets bust was once located with a plaque that commemorates the poet and has a few of his quotes. 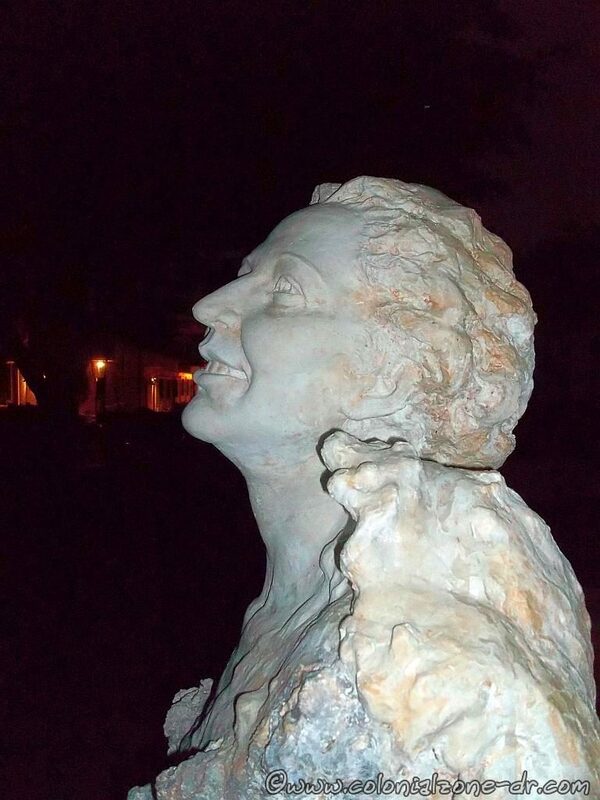 The bust of Poet Julia de Burgos in Parque Rosado. The newest addition to the park is a bust of Julia de Burgos, created by sculpture René Alejandro Guzmán, and inaugurated February 6, 2014. Burgos, a playwright, poet, journalist and activist, is considered to be the most outstanding Puerto Rican poet of the twentieth century. She hung in the circles of intellectuals like Juan Bosch and Dominican politician Juan Isidro Jiménez Grullón, who became an inspiration of many of her best poems. She was a fighter against political injustice. In 1944 she wrote two poems for the centenary of the country: “A la Ciudad Primada de Santo Domingo” and “Hymn to the Blood of Trujillo”. More of the story of Julia de Burgos. Plaza Pellerano Castro under the soft lights at 5AM. 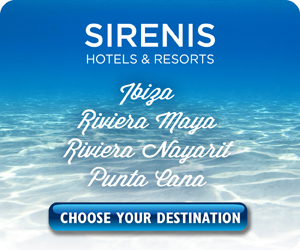 Location: Walking from the eastern end of the Conde turn right towards the sea (north) on Calle Isabel la Católica or Calle Las Damas. Walk to the end of either of these streets and you will run into the park. Located at the intersections of Calles José Gabriel García, Arzobispo Meriño, Isabel La Católica in the Colonial Zone.